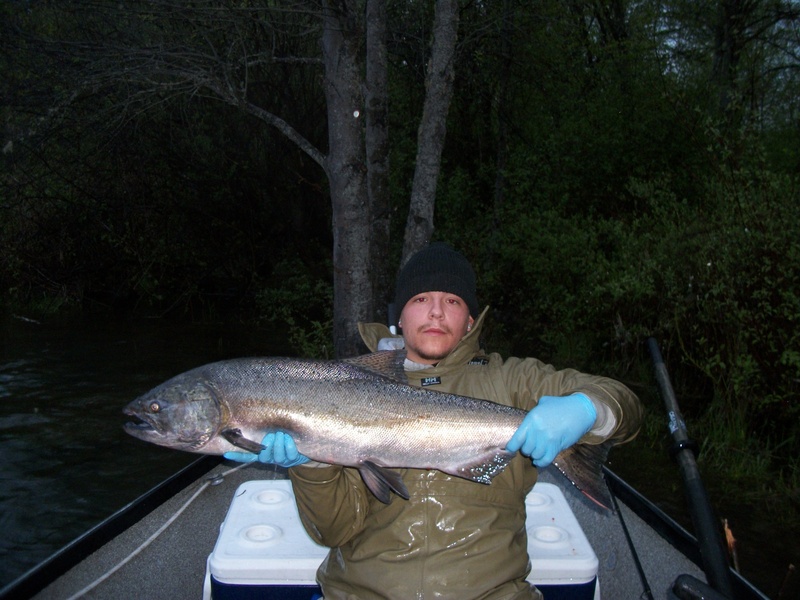 Phil’s First Rogue River Springer! Iv been super busy lately. Also my laptops keyboard has been on the fritz. So my fishing reports have been put on the back burner. The coolest reason iv been so busy lately was the rafting guide school I took part in recently. It was 4-5 days of learning, camping, rafting on new waters, and meeting some great folks. So before i went on that adventure, i went Salmon Fishing three days in a row on the Rogue River. This report is the first day of the three, May 17th. The day started out bright and early. Me and Phil got to the boat ramp a little after legal fishing time because we could hear the bankies on the hatchery wall catching fish and slinging lead. We were some what intimidated to launch the boat because we heard a couple splashes near us that we swore were them tossing stuff. We eventually decided to brave the bankies and when we got past the big line of them we both let out a breath of relief. From then we thought we would be in the clear to get to our spot and anchor up and fish by our self’s in peace. That changed when we floated down towards the spot and we seen headlights up on top of the cliff above the first spot to fish. We got down there just as the bankie managed to descend the cliff so we had to share the hole. We sat there with two plugs out and proceeded to watch the guy fishing on the bank rip the hole up. Its kinda weird watching a guy try to snag fish that are jumping right in front of him every two minutes. At one point he pretended he had a shot gun and said he’d rather shoot one haha. So me and Phil were waiting there for a take down to occur, when the inevitable happened. He crossed one of our plug lines. So he reeled in one of our plugs and tried to untangle the mess, while this was happening we looked over to the other rod and seen a fish was on it! Phil grabbed the other rod and proceeded to muscle in this hawg. He had 75lb Braid for the main line and 25lb mono for the leader, so this fish was landed in record time! Before I knew it the fish was near the boat and Phil was handing me the rod so he could net it, guess he didnt want me to lose it lol. The net job is very important with big fish like Salmon and Steelhead we’ve been catching lately, one little mishap and you can kiss that fish good bye with out ever laying a finger on it. So we got it in the boat and started high fiving each other we looked at each other in amazement, like “did that just happen” ? It was an awesome fishing moment that happened so quickly its hard for me to write it all down. I don’t think we had been there for more then an hour but we had a big fish in the ice chest! Other then that, the day was kinda lousy, mainly because of the weather. Id been perfectly happy if Phil only wanted to fish for 3-4 hours, but we stayed out there for well over 11. And it rained 85 percent of the time. I definitely would of hinted to Phil that i was ready to go, but in those times i just sucked it up. Mostly because i know he doesn’t get to get out to the river much with school and having a kid. So he spends more time out there then most, and i don’t want to lose my seat on his boat by complaining lol. Well thanks for reading and look forward to many more reports/stories. Tight Lines and Be Safe! PS. This fish was the only bite we had for the whole day. Salmon fishin is tough!!! Met Phil and his buddy from Happy Camp CA, Mario to do some fishing on the Rogue River. We met at the hatchery around 11am. We got down to the first hole and wouldnt you know Charlie Brown was anchored up in it plugging away. Before he seen us I yelled out ” Get out of our hole!!”. We anchored up 40 yards away so we could get our rods ready and chat and wait for him to leave the hole. He said he would get out shortly. But about 4 minutes after he said that they had hooked up on a nice chrome hatchery hen! Phil was pissed, i thought it was funny! They netted it and got out of the hole so we could fish it, they tagged it and took pictures and that was the last we saw of them that day. We stayed in the hole for over an hour then we finally had a take down. It came on my rod and I fought the beast for about 15 seconds then handed the rod over to the guest Mario, iv been catching alot lately so i dont mind when other people get to catch them too! This fish was pulling out a ton of line, it was a hawg. It went almost all the way down the rapid but then stopped. It must have seen the tree. I told Mario to try to pull it away from there then it was all over. Oh well. The big ones are hard to catch some times. After that all we could bring to the boat were half pounders and trout. I lost a great opportunity at a big one on our 3rd run of the day. Guess next time we’ll have better luck! No pictures this time. But i did do my first ever fishing video! I Used Windows Movie Maker to edit some clips i took with my camera. Since it also does ok video along with great pictures im gonna start making fishing videos! Gives you a better look into our fishing then just a picture. So enjoy and tight lines!